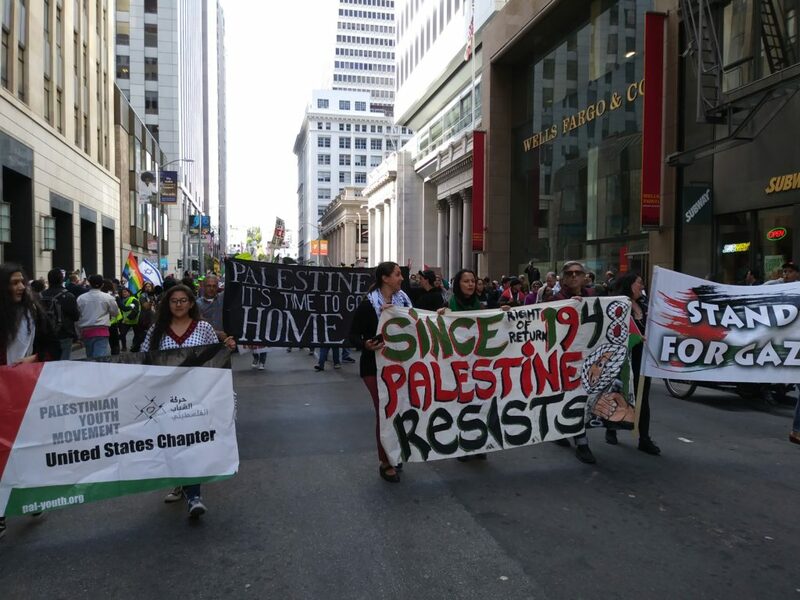 A Palestinian Nakba commemoration/demonstration was held on May 15 outside the Israeli consulate in San Francisco. 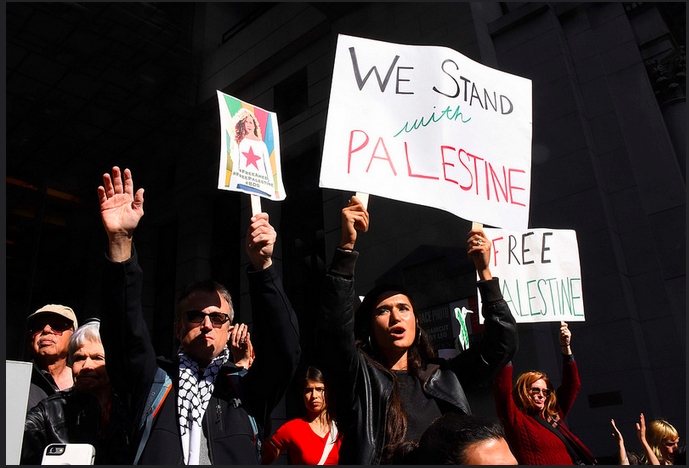 Over 1,000 Palestine supporters turned out to mark the 70th anniversary of the Nakba (the Catastrophe), when over 750,000 Palestinians were terrorized, forcibly displaced, and often killed, before and after the Israeli declaration of independence on May 14, 1948. 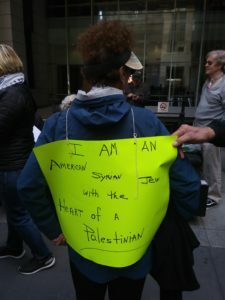 The demonstration was organized over several months by the Palestine Action Network (PAN), a coalition of organizations including the Arab Resource and Organizing Center (AROC), Jewish Voice for Peace (JVP), Middle East Children’s Alliance (MECA), NorCal Sabeel, and the Palestinian Youth Movement (PYM). Several of the organizations are based in the East Bay, including Oakland. 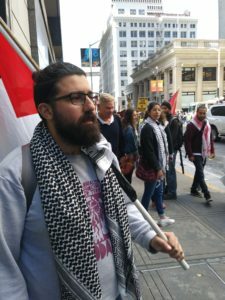 A very mixed group of people came from throughout the greater Bay Area: there were Palestinians, Americans, and people from other countries; there were Muslims, Jews, Christians, and people with no religious faith; there were people of all ages and all genders; there were people from many races and ethnic groups. 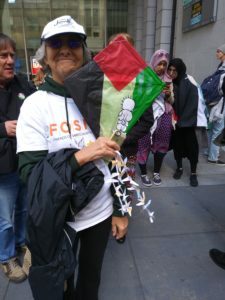 Consiglieri came with a homemade kite with the image of Handala, an iconic character created by the political cartoonist, Naji al-Ali, who was born in the Galilee, but grew up in a Palestinian refugee camp in Lebanon. 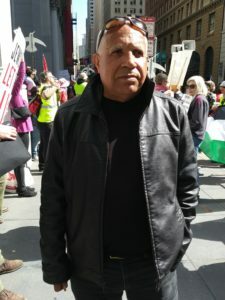 “I’ve been to Palestine twice and it’s unconscionable what the Zionist Israeli government is doing to the people of Palestine. (Archbishop) Desmond Tutu from South Africa said that the apartheid in Palestine is far worse than it ever was in South Africa. 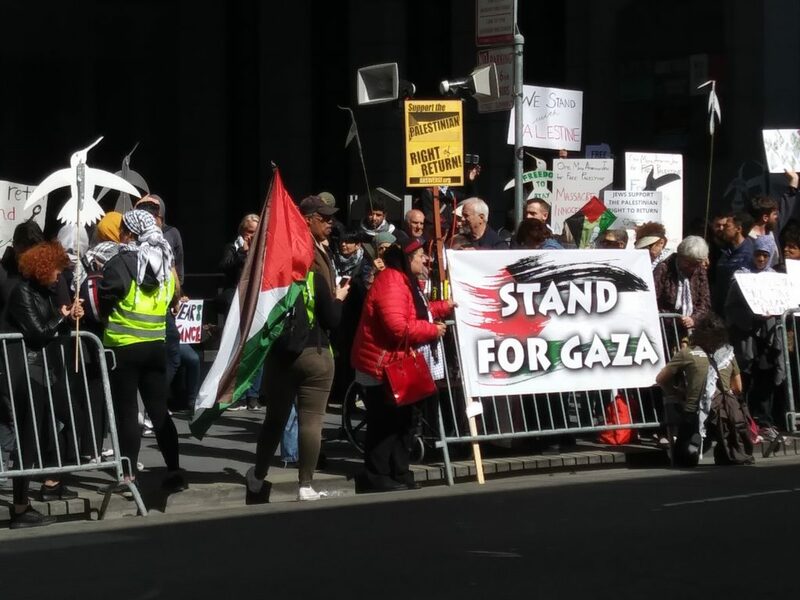 They have separate roads and the potholes on the Palestinian side are awful and the freeways for the Israelis are like the freeways in America,” Consiglieri said. Ziad Abbas, from MECA, was born and grew up in the Dheisheh Refugee Camp in Bethlehem. “My family, they are refugees from two villages. They were uprooted in 1948. Zionist groups started attacking the villages and towns. They started attacking (my parents’) village. They killed three people. So most of the people moved to the mountains. That day in October, when they left the village, my mom, she had two children. My sister was two years old and my brother was two weeks old. My mom closed the house and took the two children and just a few things to survive for one, two days. She thought they were coming back after the bombing stopped, but they (the Zionist groups) kept pushing them back. But, it’s now 70 years and we never went back,” said Abbas. Speakers from various organizations addressed the crowd. “There are now 7.2 Palestinian refugees living around the world. The population of Gaza is almost 2 million. Today is the date we will remember the massacres and forced dislocation of the Palestinian people. The Nakba is a time of mourning, of dispossession. A time of waiting. A time of perpetual resistance. But today, we see that memory lives,” said Judith Butler, with JVP. 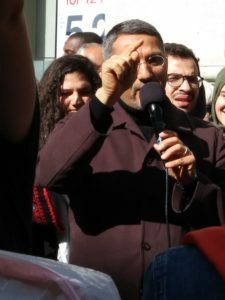 Hatem Bazian, professor of Islamic Law and Theology at Zaytuna College and founder of American Muslims for Palestine, called out the complicity of the media and politicians in events that have been occurring in Palestine/Israel: “Let us be clear. It was a massacre that occurred yesterday (in Gaza, when about 60 Palestinians were killed and thousands injured by sniper fire). It was committed by politicians who knew exactly what they were doing. It was a premeditated massacre. Systematic, deliberate,” said Bazian. “The media must be held to task. We need to challenge not just the shooters, but the media and the cowardly politicians,” he added. At one point, the names of Palestinians killed in the recent killings by sniper fire in Gaza were called out, in order to remember them. One hour after the demonstration began, the crowd began marching down Montgomery St. to Market St and, eventually, to the federal building on 7th St.
Spectators gathered on the sidewalk, watching, listening, and sometimes reading flyers and taking pictures or video clips. Drivers honked their horns. I overheard onlookers explaining to each other what they understood was happening. For example, one young man was explaining to another man, a stranger, that thousands of Palestinians had been dispossessed in 1948 after Israel was created. The ethnic cleansing of 1947-48 continues today as Israel kills peaceful demonstrators, such as has happened in Gaza in recent weeks; appropriates large swaths of land in the West Bank; forces Bedouins off their ancestral lands in the Negev into towns (reminiscent of how Native Americans were forced into reservations in the U.S.); encourages the building of huge illegal settlements in the Occupied West Bank; allows Jewish settlers to force Palestinians out of their homes in Jerusalem and elsewhere in the West Bank; and prohibits Palestinian refugees from returning to their homeland. Great coverage. Loved the many “voices” of diverse imdividuals, each of whom added depth to our understanding of the current (and past) situation in Palestine. 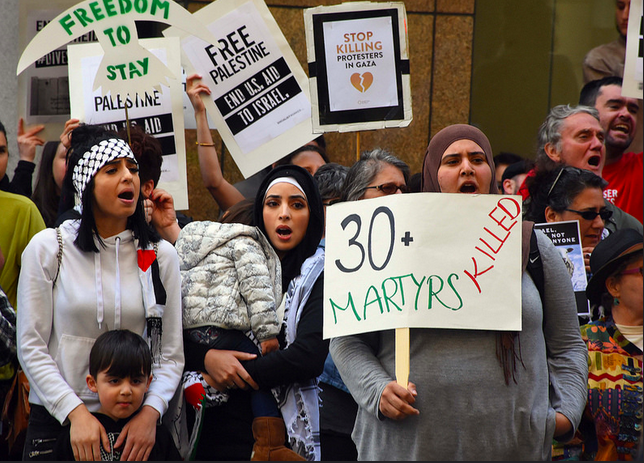 With so much injustice in the world and causes crying out for attention, the personal voices of affected Palestinians compels us to take note and, hopefully, action. Thank you Katharine. I’m glad to have learned about this demonstration. I was unable to come, but wish I could have been there. It is awful what has happened to the Palestinians. Great coverage of an important event! Kudos to Ms. Davies Samway for a comprehensive summary. Thanks to Katharine S.Samway for the excellent article. What happened to the Palestinian people in 1948 was nothing more than a catastrophe ( man made ) when the land of the Palestinian people was divided to form the new state of Israel.This tragedy continues with the occupation of the Palestinian territories ( West Bank and Gaza) by the powerful Israel army plus the finance help by USA. Thank you, Katharine. Another excellent and informative article! Voices that need to be heard. Katharine, thank you for this fine article! So glad it was published. This story must be told now more than ever. Love to you and Tom…keep me on your notice list.